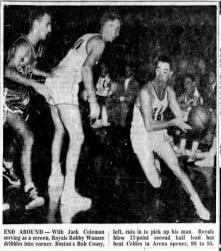 Recently, Rochester marked the 64th anniversary of one of two auspicious events in its basketball history. As seen When NBA history was made at Edgerton Park, on October 31st, 1950 Earl Lloyd became the first black player to appear in a regular season NBA game. Almost four years later on Oct 30, 1954, Rochester would be the site of the first NBA regular season use of the 24 second shot clock, the new rule designed to prevent stalling, excessive fouling, speed up the game and increase scoring. The shot clock would later be adopted at all basketball levels. When the Royals hosted the Boston Celtics in the season opener, it was the first game in which the new 24-second shot clock was used, and the estimated 1,700 fans in attendance saw Rochester, behind 25 points and 11 assists from Bobby Wanzer, pull out a thrilling 98-95 victory that wouldn’t have been nearly as exciting without the clock. Interestingly, in the afternoon before the game, members of the Royals and Celtics offered a clinic to aspiring basketball players in the Rochester area — hence, the last time Cousy, Wanzer and Davies would give pre-shot clock instructionals. The innovative rule was widely credited with saving the NBA as the league struggled to compete against the big time college game. 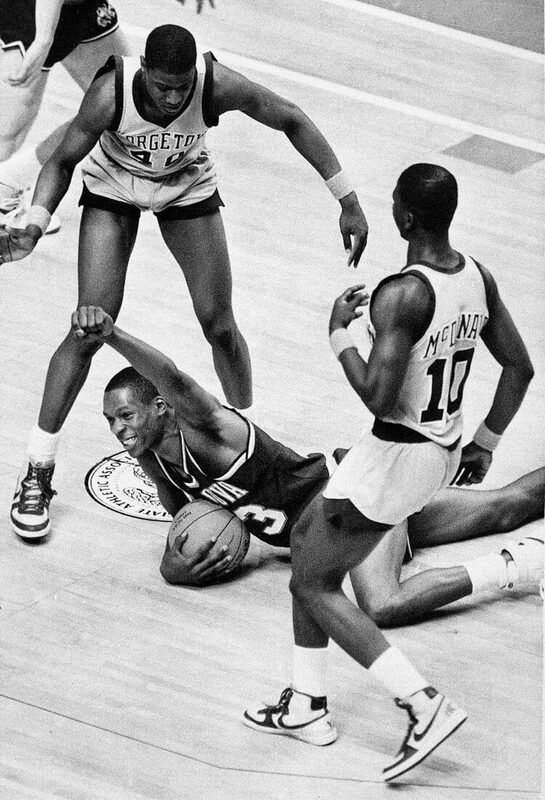 Ultimately, following the lead of the NBA, in 1986 the NCAA adopted a 45 second rule. Today — outside of venues like streetball at the Tony Boler courts at Cobb’s Hill — the shot clock is ubiquitous. At this time of the year, as the pros slog toward the playoffs and the colleges toward the tournament, I wonder why I watch so little — as in none — basketball. Could it be that basketball was better before the shot clock. For evidence, look at the four NCCA championship games before the adoption of the shot clock. 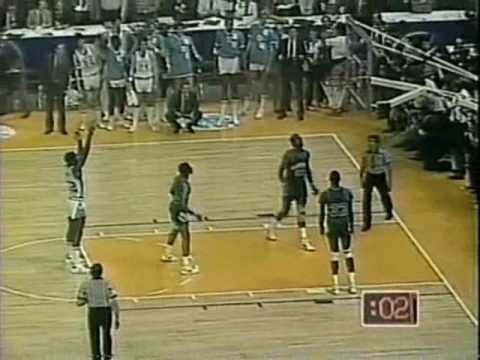 1982, ’83 and ’85 produced three of the greatest games ever played, especially the ’85 Villanova – Georgetown final often referred to as “the perfect game.” All three were full of strategy, taut and low scoring where every basket mattered. From the 1982 edition of the Yackety Yack, UNC-Chapel Hill’s yearbook. In 1982, we didn’t need a shot clock to be thrilled when Michael Jordan made the go ahead basket as time wound down in the fourth quarter only to have Sleepy Floyd miss a shot at the buzzer. 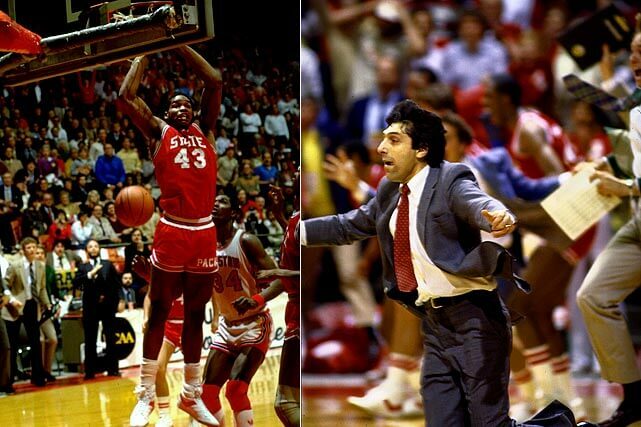 In 1983, I’ll never forget watching with friends in the basement of Brown University’s graduate center — rapt — the NC State-Houston final, especially the last two minutes that contained strategies made obsolete with the shot clock. 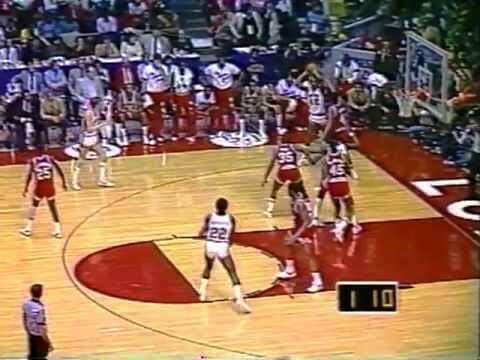 In the last minutes, Houston’s star center, Akeem Olajuwon was tiring and the Cougar’s head coach Guy Lewis decided to slow the game to take time off the clock: a pre-shot clock stratagem. With the score tied at 52, the Wolfpack and Cougars played an excruciating — and dramatic — game of cat-and-mouse, feigning scoring drives or pressuring the defenders without fouling. Houston had only one possession in the last two minutes, culminating in a missed one-and-one free throw. The Wolfpack tenuously held the ball for the last 44 seconds, 20 seconds more than allowed in the NBA. Houston needed a defensive stop to get another chance to close out the game. Lewis decided to move from the man-to-man defense his team had been running the whole game to a half court zone trap defense. The pre-shot block era was known for its chess-like shifts between defensive and offensive formations. The Wolfpack — not expecting the adjustment — were forced to deviate and began passing the ball just to prevent the Cougars from stealing. Houston nearly got the potentially game changing turnover when NC States’ Whittenburg made an errant pass knocked down by Houston’s Drexler that Gannon regained, barely. In the final frenzied seconds, NC States’ Lorenzo Charles went up for an air ball, and, in one motion, scored the go-ahead points with a two-handed dunk as time ran out. In the second half, the Hoyas borrowed a page from Villanova’s offensive strategy by running the four corners offense — made obsolete with the shot clock — hoping to make the Wildcats abandon their regular defense and shift to man-to-man coverage. 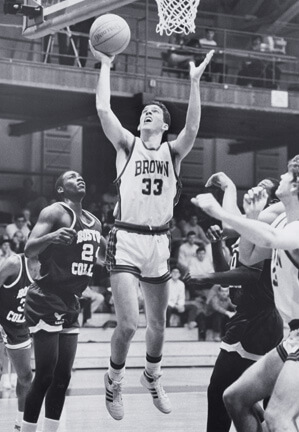 In 1986, my school, # 16 Brown University, made only its second ever NCCA tournament appearance and its first since 1939 against #1 Syracuse. The NCCA had adopted a 45 second rule making it harder for my upstart Bruins to match the Orangemen’s run-and-gun, NBA style. Despite leading early, we lost 101-52. 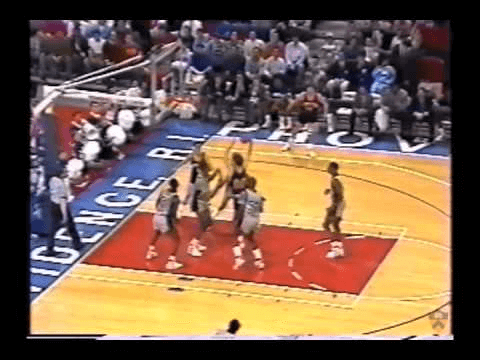 As seen in One final shot at the greatest March Madness upset, Providence, St. Patricks Day, 1989, in my only NCCA tournament game watched in person, the # 16 Princeton Tigers battled the #1 Georgetown Hoyas to a 50 – 49 loss. Although there was a 45 second shot clock, Princeton’s Coach Pete Carrill milked every second. The game showed definitively that lower scoring games are more thrillingly memorable than up-and-down-the court yawners that collectively accumulate 250 or more points. The days of long possessions, draining the clock, the cat-and-mouse of defensive pressure vs. defensive fouling, the chess-like gambits between stalling and up tempo offensives, the nail biting last few minutes made more dramatic the fewer points that were scored are gone. Maybe basketball was better before October 30th, 1954 in Rochester, New York. Were rare coins in the Principal's safe at Brighton High School, 1935?